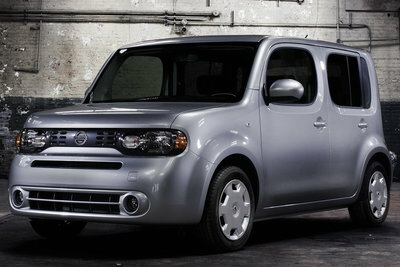 The third generation of the Nissan Cube is offered for the first time in the US market. The Nissan Cube is a small boxy vehicle with seating for five. The stylish exterior is asymmetric with a body-colored c-pillar on the driver's side and a hidden pillar on the passenger side. The interior features an undulating headliner inspired by a Jacuzzi. The side doors are traditional forward hinged, but the tailgate is side hinged opening to the left. The Cube is powered by a 1.8L four-cylinder rated at 122-bhp. Fuel economy is as high as 28 city/30 hwy on models equipped with a CVT. Although the Cube is uniquely styled, its diminutive size and pricing beg comparisons with the Honda Fit and other small imports. The next generation of Nissan's Cube will be sold in the North American market starting in 2009/2010.